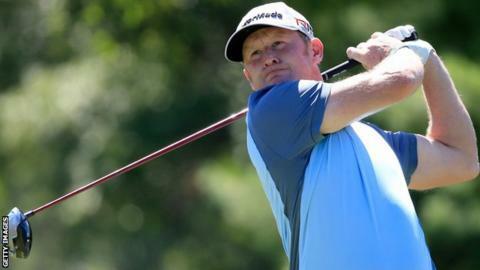 Jamie Donaldson is targeting a fruitful fortnight in America to kick-start a sluggish season and improve his hopes of reaching the PGA Tour play-offs. The Welshman, 39, will play in the WCG-Bridgestone Invitational in Ohio, which starts on Thursday, followed by next week's US PGA in Wisconsin. Donaldson has managed two top-10 finishes this season on the PGA Tour, leaving him 122nd in the rankings. "I need to push on over the next couple of weeks," he told BBC Wales Sport. "My game isn't far off, I just need to put it all together in the same week. Hopefully that will get me into contention to win and I'll take it from there." As it stands, Donaldson's ranking will guarantee him only a place in the first FedEx Cup play-off event, The Barclays at Plainfield Country Club, Edison, New Jersey at the end of August. The lucrative end-of-season series then heads to the Deutsche Bank Championship in Massachusetts, where only the top 100 players are invited. The field will be cut further to 70 for the BMW Championship, before only the top 30 will make it to the Tour Championship. "There are a few things I need to tighten up on and hole a few more putts," said Donaldson, who was encouraged by his tied-49th place at the Open Championship. "I've got two weeks in America coming up - the Bridgestone and the PGA - to cement a FedEx finish and see how many events I'll play in. "I need to try to get in them all, which is going to be a stretch." Donaldson will play alongside China's WC Liang in the opening two rounds at the Bridgestone Invitational, starting at 14:35 BST on Thursday and 18:05 BST on Friday. Rory McIllory will not be there to defend his title in the penultimate WGC event of the season as he continues his recovery from an ankle injury.